One of three of the different finishes – there is also a metallic finish option. Satin and shimmer would be the finish of preference for me normally but having swatched and tried these I really like all three. They are silky smooth, highly pigmented and easy to blend. Wild sable is a lovely mid brown that is perfect for adding depth and definition to the eye without going overboard. But sugar biscuit and berry burst are both absolutely stunning. The paler sugar biscuit is a pretty shimmer – ideal for highlighting or all over the lid for a light daytime look, berry burst is a rich jewel-toned shimmer that is lovely for an alternative to a brown/black smoky eye. I think this berry shade is flattering for all eye colours – it’s not a shade I have tried before but I really like it. Just looking at it again now – it’s so pretty! 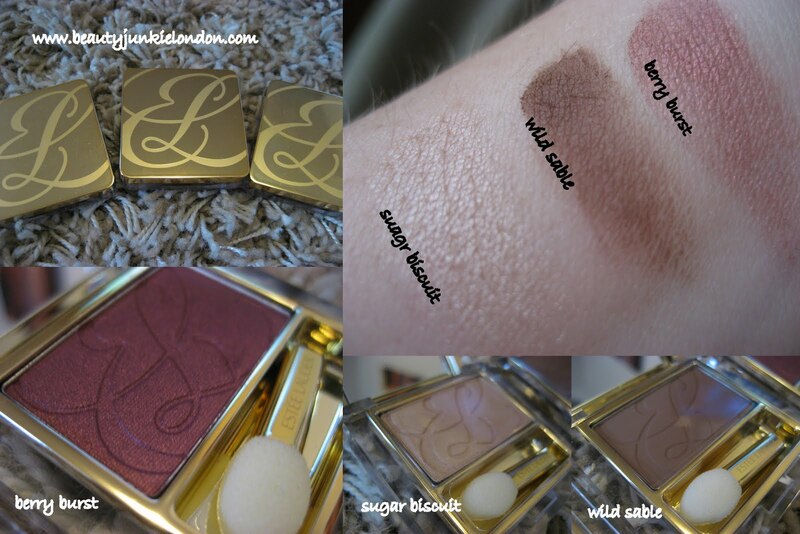 In typical Estee Lauder style – the packaging is pure luxe. Gold and glossy, with the swirly ‘E’ and ‘L’ on the lid and embossed onto the shadow – which almost makes them too pretty to use! Inside is a small mirror and applicator – Personally, I wouldn’t really use the applicator – preferring brushes or my fingers – but they really are luxurt embodied in make-up. The RRP is on the higher end of the scale at £15.50 per shadow – but this isn’t much more than a MAC shadow and much more glamorous. Plus they really are amazing quality. Like with the lip glosses I have included the chart of colours available below (all 24 of them!) so you can have a look if anything takes your fancy. I really want to check out smoky ember (shimmer), midnight star (metallic). What do you think of these colours – anything you like the look of? 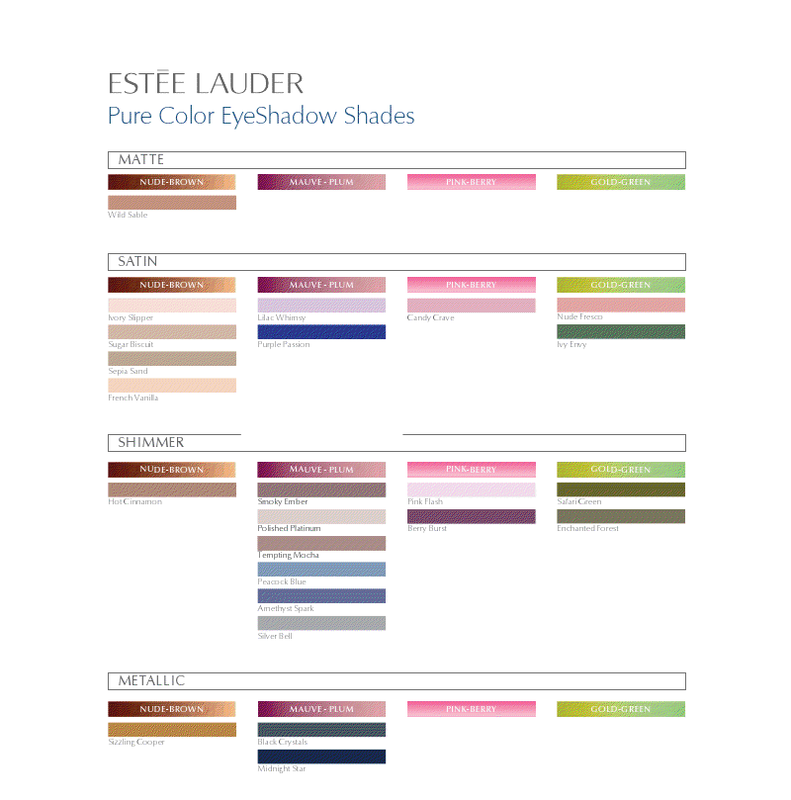 What are your thoughts on Estee Lauder in general?? The new Pure Colour Eye Shadow Shades are available on counters in July. The products in this review were sent free of charge for review purposes. All opinions are honest and impartial.